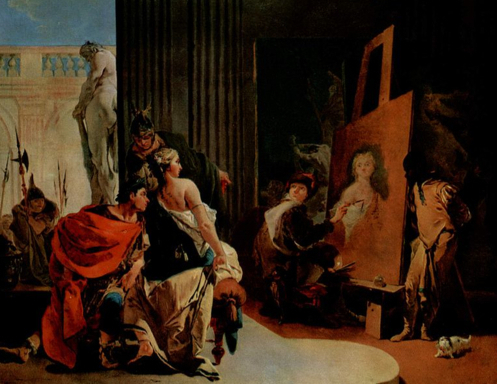 Born in Venice, the youngest of six children of a shipping merchant, Giambattista Tiepolo (1696–1770), went on to become the greatest and most prolific decorative European painter of the 18th century. His earliest known works are the Apostles painted in the spandrels in the church of the Ospedaletto (1715–6). In 1719, he married Maria Cecilia Guardi, sister of Francesco and Gian Antonio Guardi; together they would have nine children. Although Tiepolo used cool, shimmering colours, his paintings have an irresistible luminous quality, and he was soon in great demand, painting commissions in several Venetian churches and for the Dolfin family, in the Ca' Dolfin on the Grand Canal and for the Dolfin archbishop of Udine, then part of the Venetian Republic. His reputation grew across Europe, and in 1750, he was commissioned by Prince Bishop Karl Philip von Greiffenklau to paint in Würzburg. In 1753 he returned to the Veneto, and painted the ceiling of La Pietà and the panel frescos for Ca' Rezzonico. In 1762, when he was 66, the Senate, wanting to ingratiate itself with the king of Spain, ordered him against his will to go to paint ceilings in Madrid. He was accompanied by his son and greatest collaborator, Giandomenico, and died there. Venice is richly endowed with his works, notably the frescoes in the Palazzo Labia, the Accademia, Scuola dei Carmini, Palazzo Barbarigo Minotto, Santi Apostoli, and the Gesuati. Other works are in Santa Maria della Fava, San Stae, San Lio, the Scuola Grande di San Rocco, Palazzo Ducale (the easel painting, Neptune Paying Homage to Venice), Sant'Alvise, San Polo, San Martino (Burano), the Fondazione Querini-Stampalia, San Francesco della Vigna, San Lazzaro degli Armeni and Sant' Eufemia.